It’s my Blogiversary! 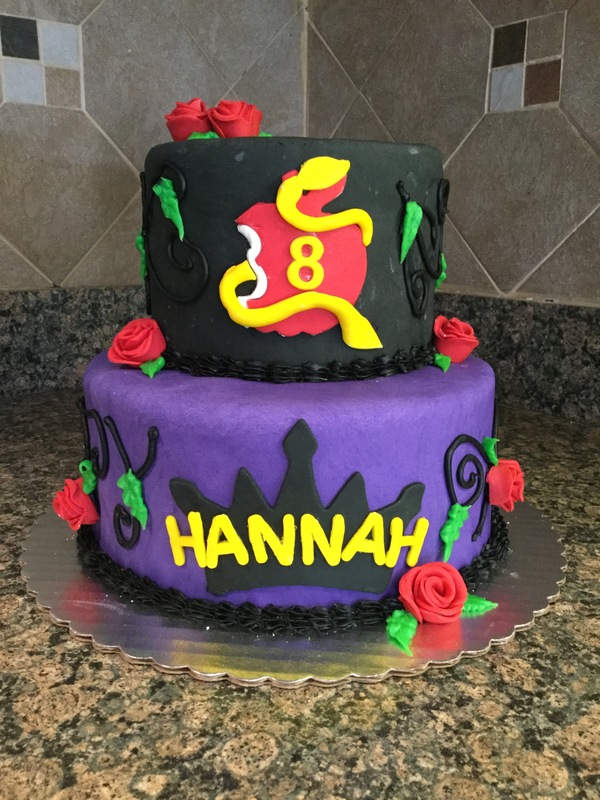 I started this blog 6 years ago and my very first post was an Elmo Cake I created for a friend’s daughter, aka my niece. 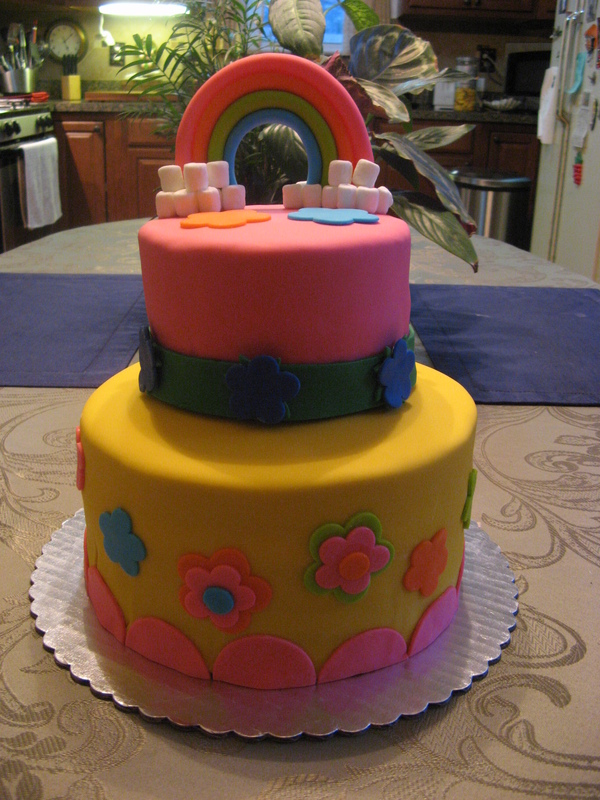 Since then the cakes have gotten a bit more elaborate and 3 years ago they turned into fondant creations. I normally ask her a month or so in advance of her birthday what theme she’s thinking of. When she told me Descendants for this year I was stumped. I had only heard of Descendants, but had no clue what the deal was behind them. So, it was off to Pinterest to get some ideas. 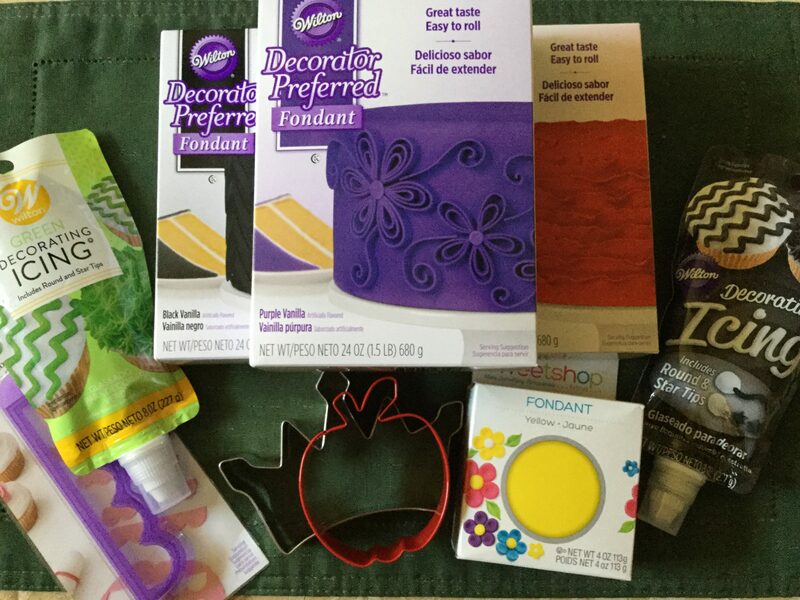 Once I had my idea down it was time to get my supplies and test out a few. 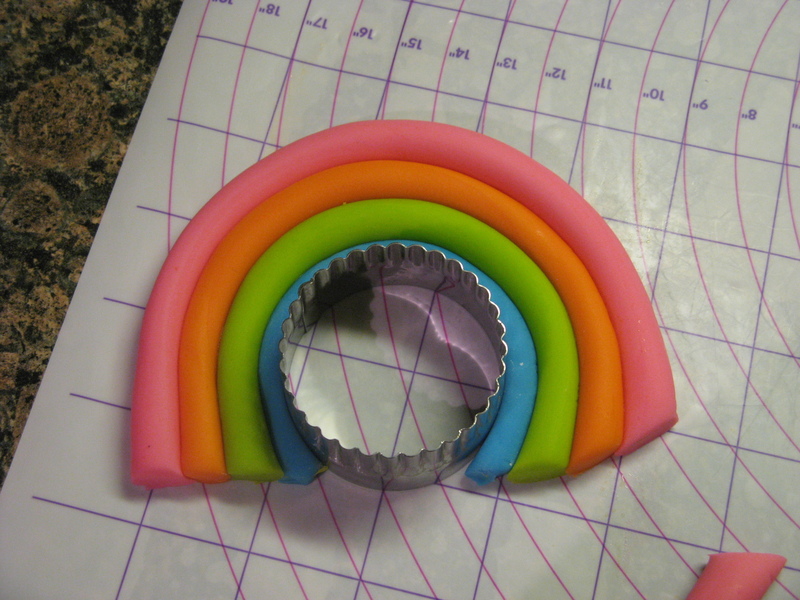 I needed to make sure that the icing was easily pipeable and also to test how thick the piping would be with the tip it came with. I opted to go with a smaller tip. I also needed to make sure that the flower cut-out I purchased would make nice roses. Thankfully it did. 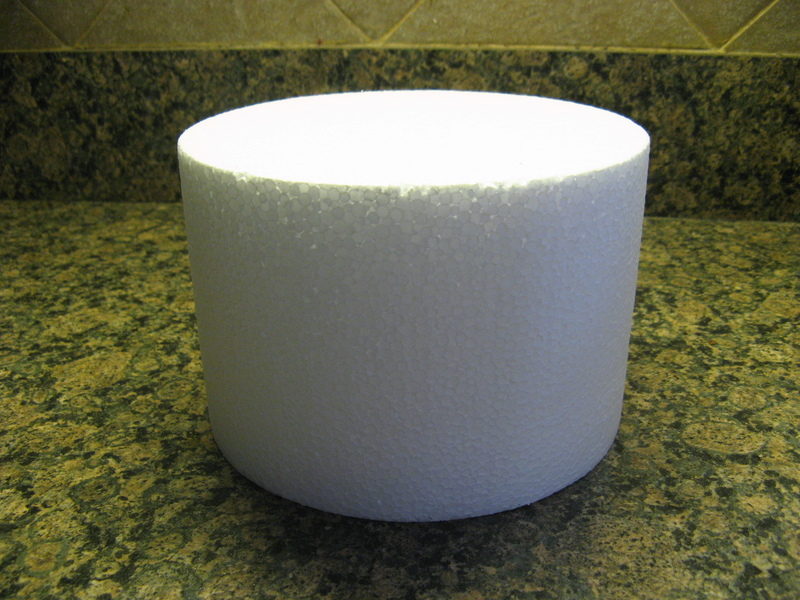 One more thing, I opted to purchase a dummy cake for the top tier of the cake. I normally do bake the cake, but, it usually doesn’t get eaten because it’s too much cake, so, to avoid waste and a little bit of stress on my part I purchased a dummy cake. In case you are wondering, it’s made out of Styrofoam. No one knew it was a dummy cake once it was covered and decorated. 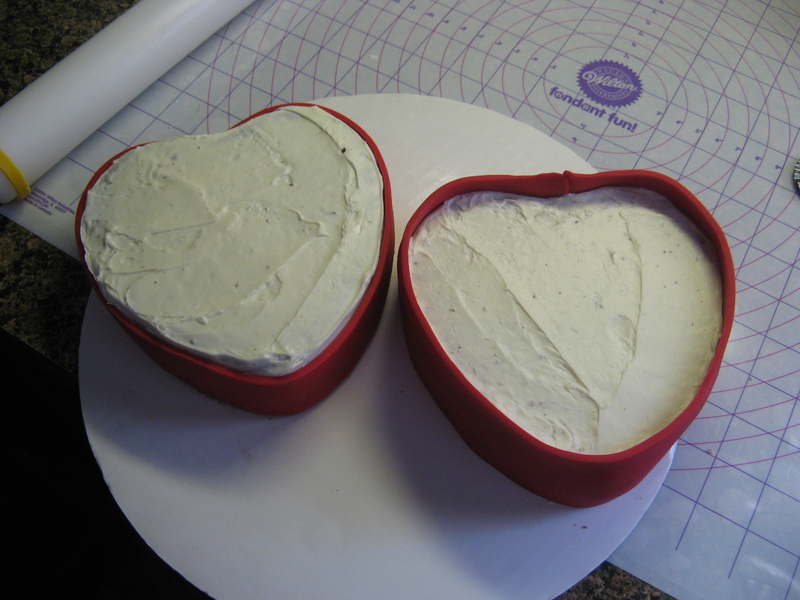 I then covered it, as well as the actual cake, in fondant. And after some piping, fondant rolling and cutting the cake came together. I have definitely learned with making these cakes that it’s important to walk away for a few minutes and then come back to truly appreciate the way it looks. So, I take a lot of mini-breaks, if not, I would probably drive myself crazy. One thing I did decide, I am going to avoid covering a cake with black fondant. I find that it tends to dry out fast and inevitably it always breaks. I had a few challenges trying to cover up the imperfections from it. 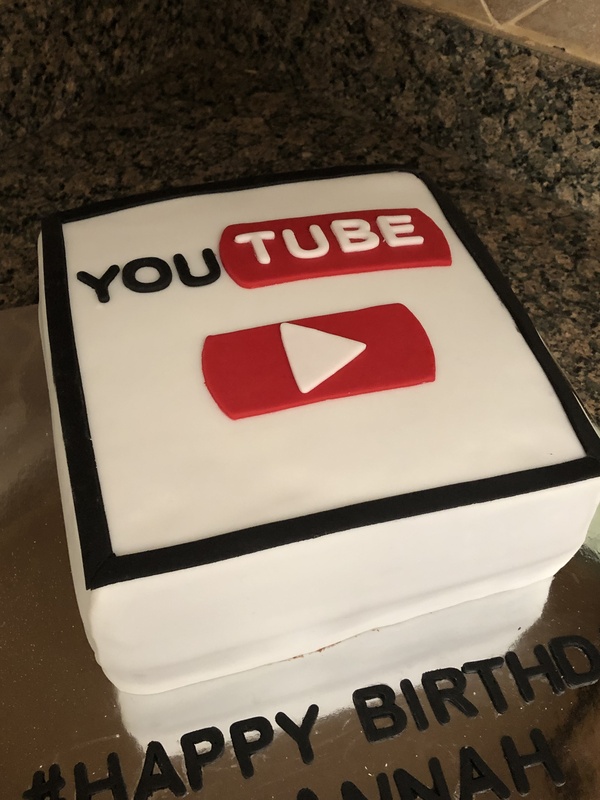 So, what will my next themed cake be…? Not sure yet. I’ll have to ask my other niece what’s she’s thinking of for her June birthday! 1 Week, 3 Cakes & 48 Cupcakes! Recently I was elbow deep in flour, sugar and butter for the better part of a week creating some lovely cakes for some momentous occasions – a friend’s daughters’ first birthday and her older daughters’ pre-k graduation. To kick off my week of cake baking & decorating I made a 3-tier 9-inch white cake layered with vanilla mousse and covered with pink tinted vanilla frosting. 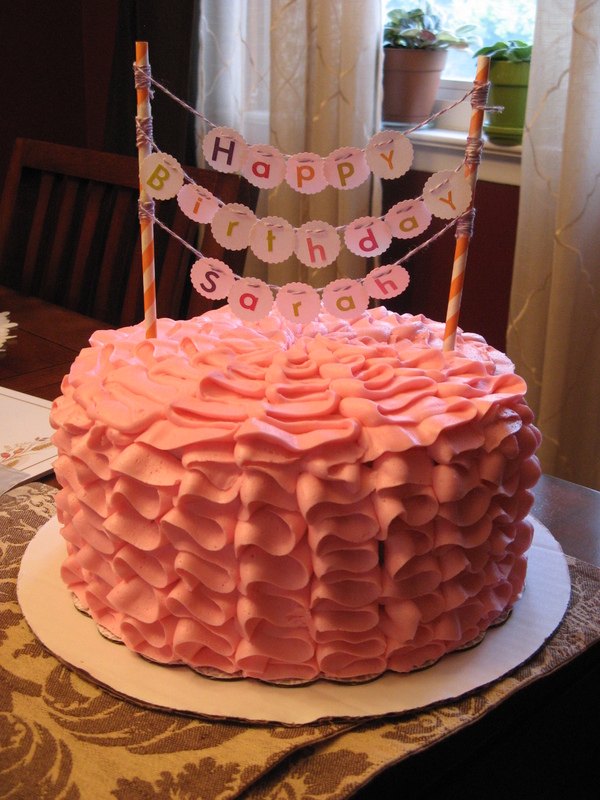 I didn’t just simply frost the cake though; I opted to decorate it with buttercream ruffles. To create the ruffles I used a No. 125 Wilton Tip, which is considered a petal tip. Unfortunately I didn’t take any pictures of the process, only the final product. 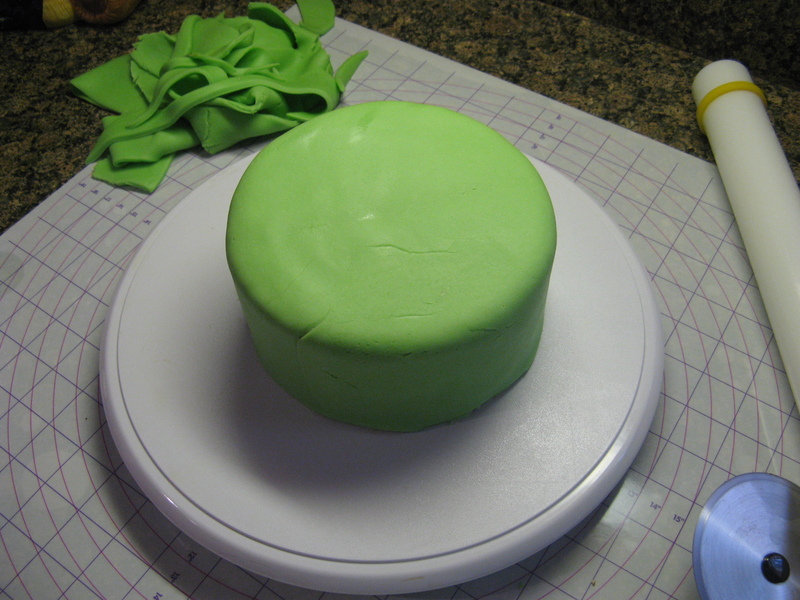 I began by applying a thin layer of frosting to the cake so the ruffles would be able to stick to it. 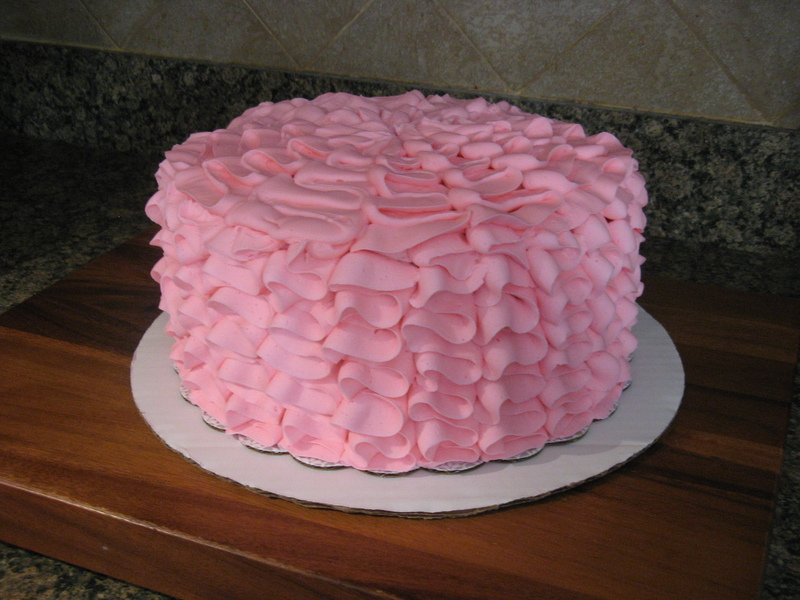 To ensure that the ruffles would be evenly spaced and the same width throughout I used a straight-edge to score the cake. 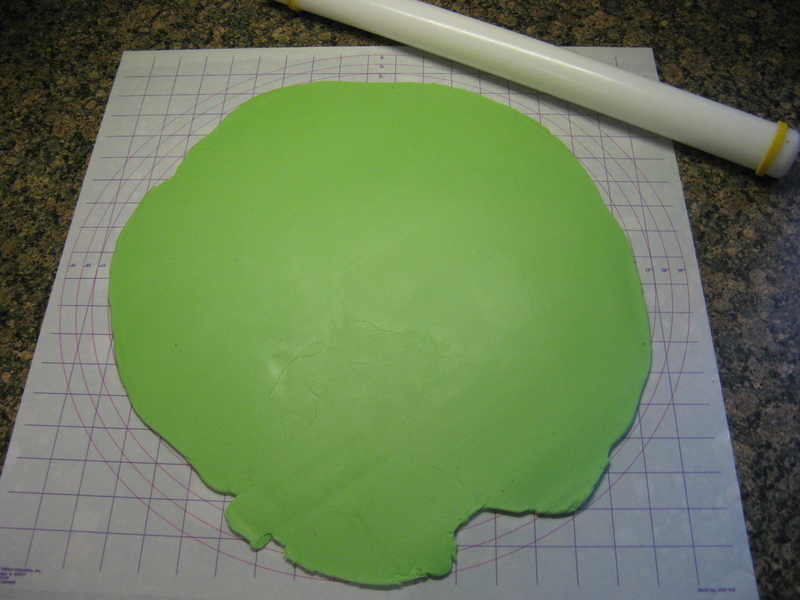 Since I had placed the cake on a cake board that had half-circles around it I used that as my guide to create the lines. Once that was done I scored lines along the top of the cake towards the center. 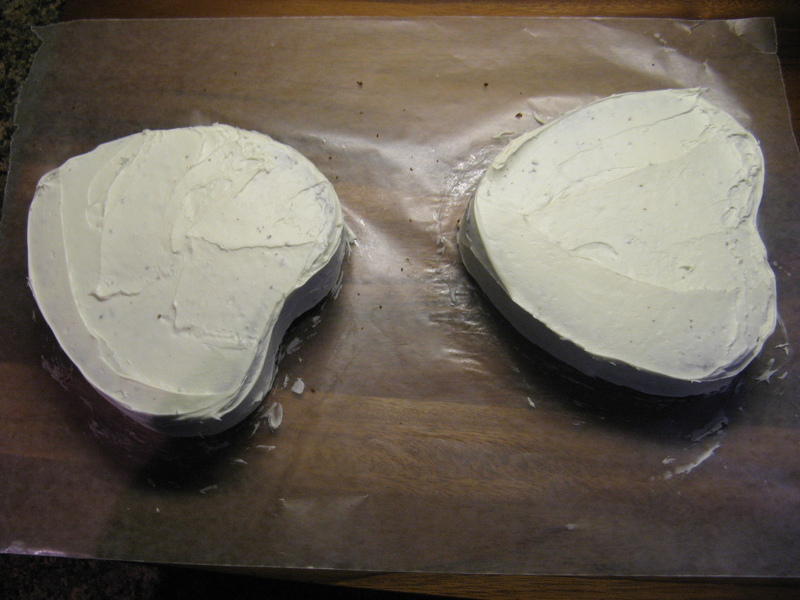 I made those lines double the width of those along the sides of the cake. 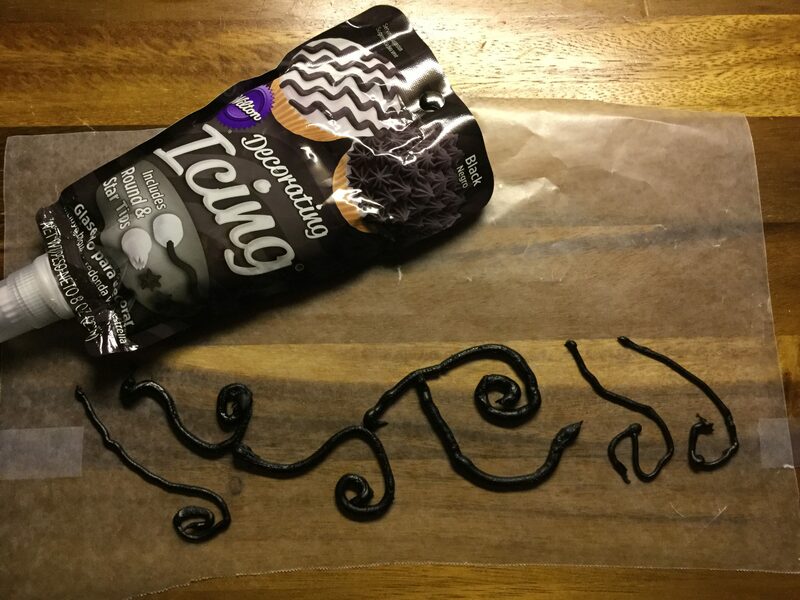 I then filled my pastry bag that was fitted with the tip and began creating the ruffles. With the thicker side of the tip against the cake I began making the ruffles starting and ending the ruffle when I hit one of the score lines. This video shows the process I used. 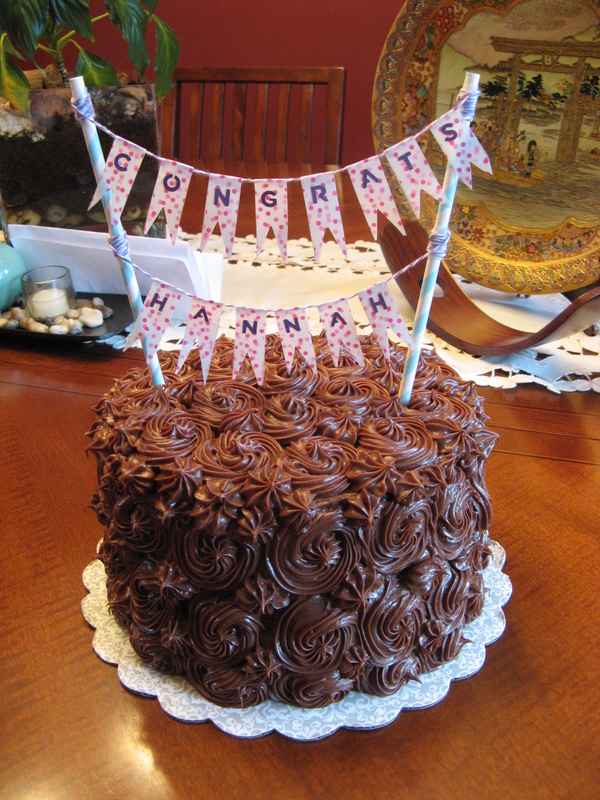 And once I got the cake to its intended destination I topped it with a cake banner topper I made. 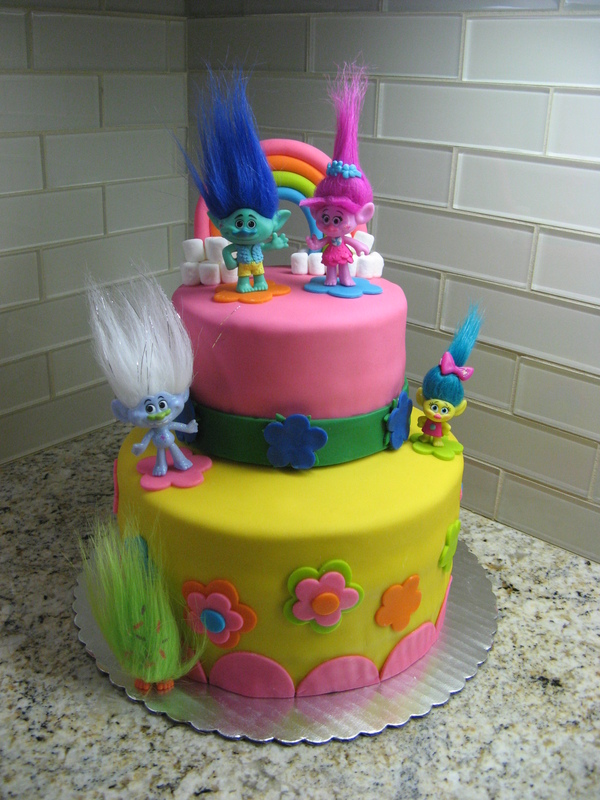 I did receive one complaint about this cake… It was too nice to cut. I was very happy with how it came out; it looked just like how I envisioned it. But, more importantly it was delicious. The Vanilla Mousse filling was perfect and the frosting wasn’t too sweet, and lastly the cake was incredibly moist and light. Next up was another cake to celebrate that first birthday. 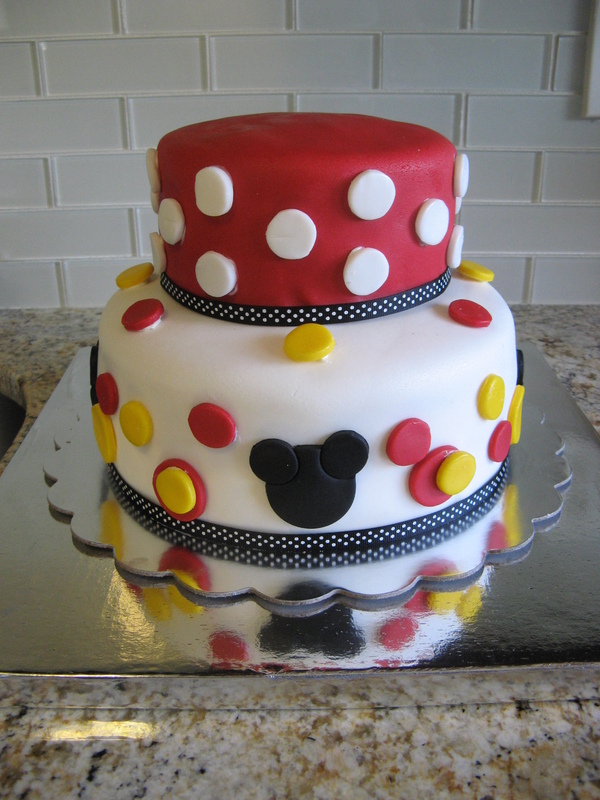 This time it was a two-tier fondant covered Mickey & Minnie Mouse themed cake. 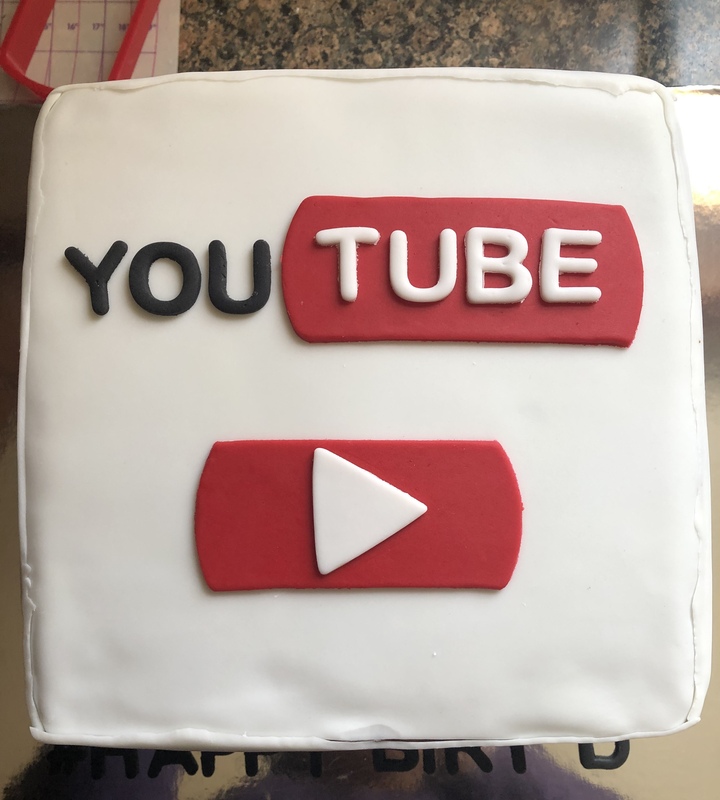 I actually had a bit of anxiety to make this cake. 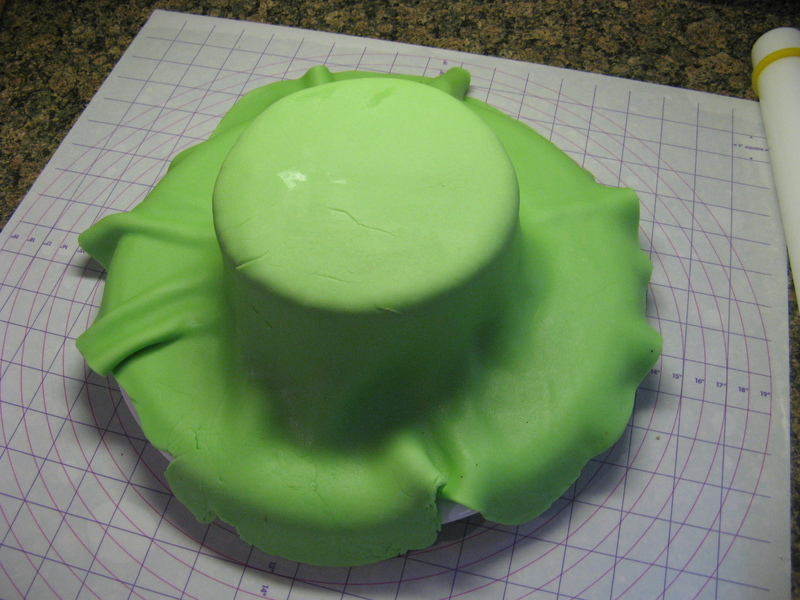 You never know what’s going to happen when you are working with fondant – mainly will it tear!?!? Thankfully there were no tears whatsoever, but, there was an air bubble here and there that was quickly remedied with a needle. 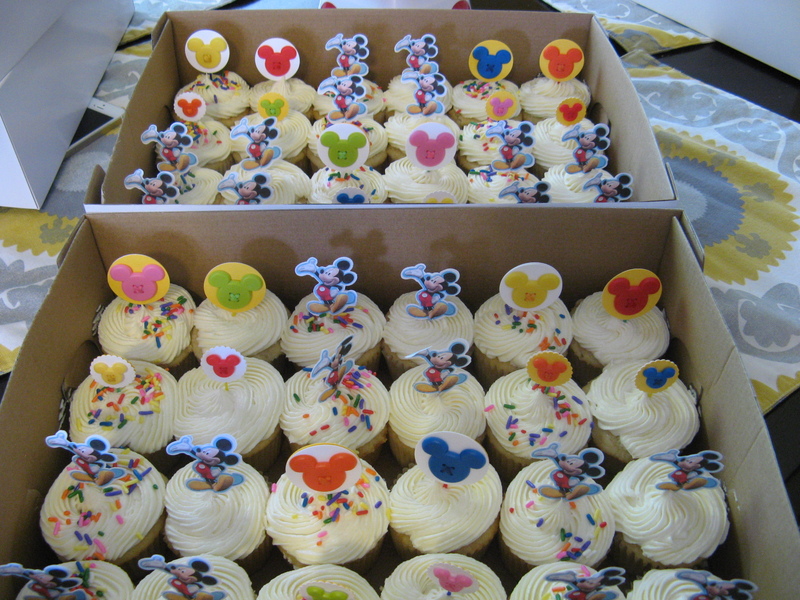 And to go along with the cake there were cupcakes that followed along with the Mickey & Minnie Mouse theme. These cupcakes actually did cause me some stress. Initially I was planning on using Mickey Mouse themed liners, actually I did use them to bake the first batch of 48 cupcakes but those liners were on the smaller side so my cupcakes all looked like they had been nibbled a little around the edges once I took them out of the cupcake pan. Definitely not something that was presentable and couldn’t be masked with frosting. So, I baked another 48 cupcakes (this blog title should really read 96 cupcakes!) using white cupcake liners that I picked up at a restaurant supply store quite some time ago. It’s a package of 500, so I’ll be using them for quite some time. But, thankfully they turned out perfect cupcakes that I then topped with vanilla buttercream frosting – the same frosting I used for the first cake. 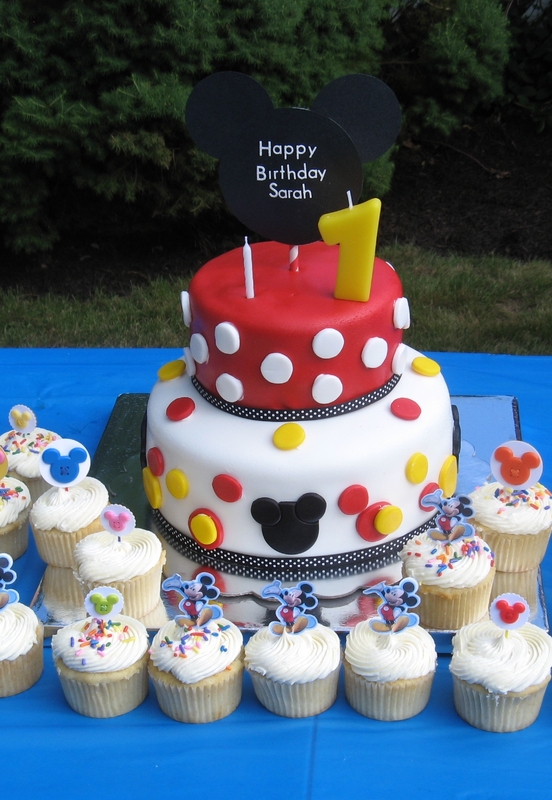 I then topped them with Mickey Mouse picks and Mickey Mouse sticker button picks (I made these) to ensure the theme traveled through to the cupcakes. Oh, and since not everyone is a sprinkle lover like myself, I only covered have of the cupcakes with sprinkles. And finally, a cake to celebrate a Pre-K graduation. The young graduate requested chocolate, so I made a Triple Death by Chocolate Cake – Chocolate Cake, Chocolate Mousse and Chocolate Frosting. It was a lot of chocolate but delicious nonetheless. 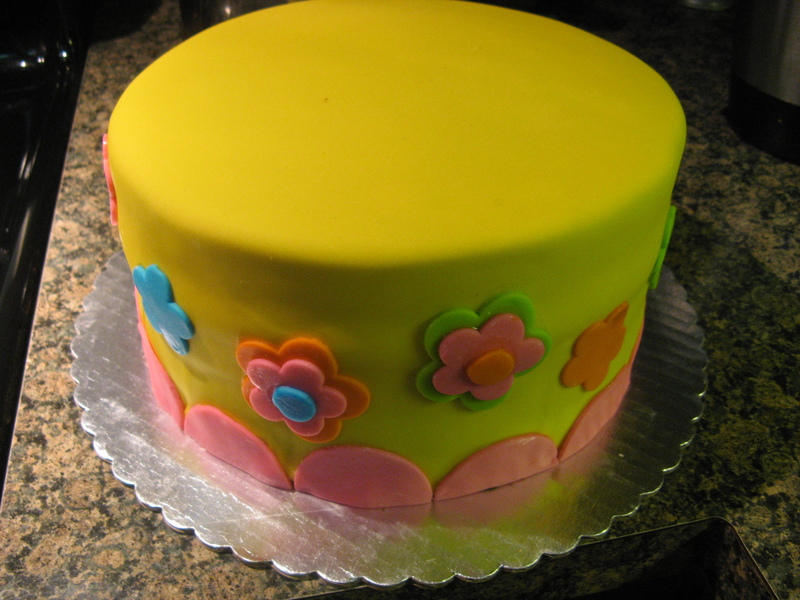 To decorate this cake I opted to cover it with rosettes using a No. 22 Wilton Tip. Initially I was going to use a 1M Tip, but my rosettes just looked too sloppy so big. And to finish it off I topped it with another cake banner topper that I made. After a week like this I think I’ll take a break from cakes and cupcakes and stick to cookies for a bit! A great thing about blogging and social media – Instagram in particular – is the chance to discover other bloggers. 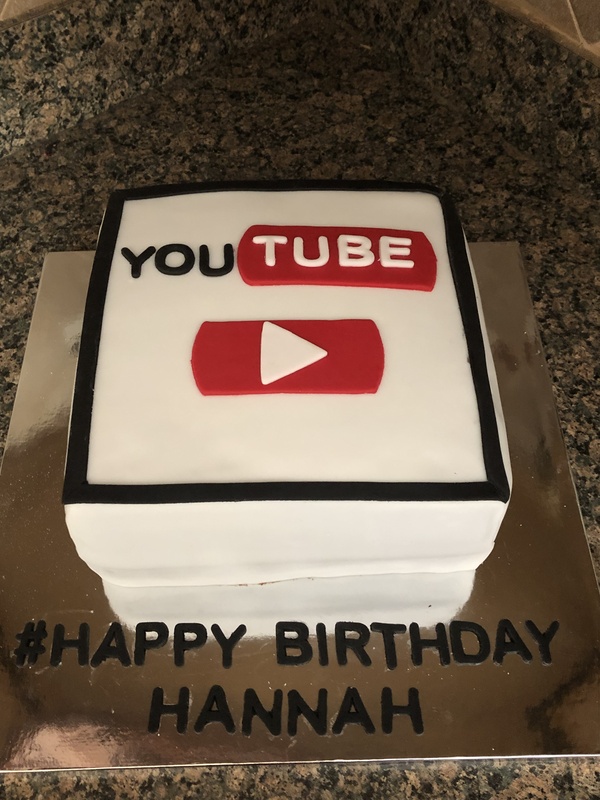 One blog that I have enjoyed following is The Cake Blog – a blog with amazing cake designs that include tutorials so you can recreate them yourself if you wish. 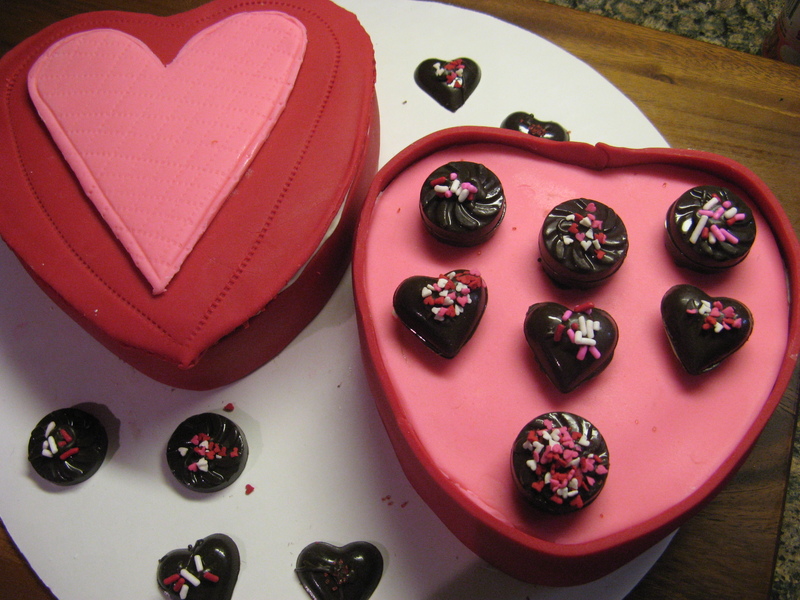 Recently they featured a Valentine’s Heart Candy Box Cake that I thought was too cute not to try. 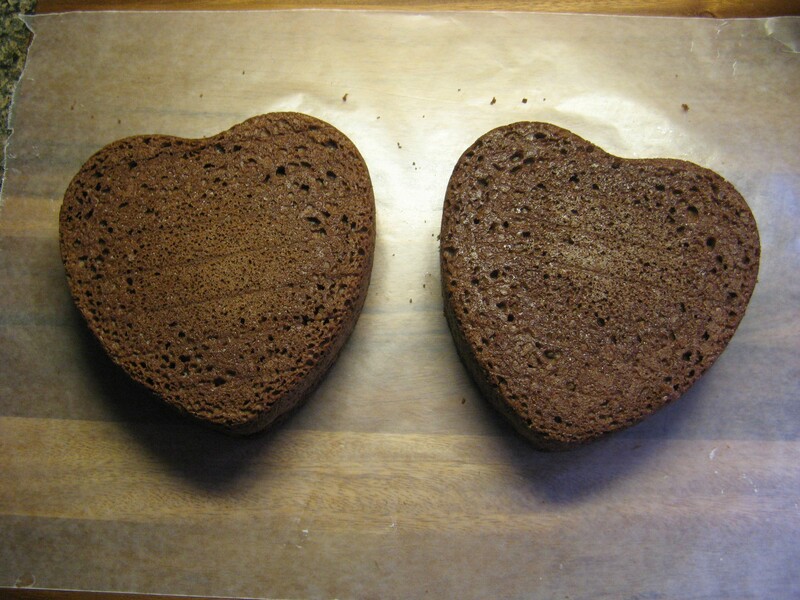 Using one milk chocolate box cake mix I baked two heart cakes filling the pan with about 2 cups of batter for each of the cakes. 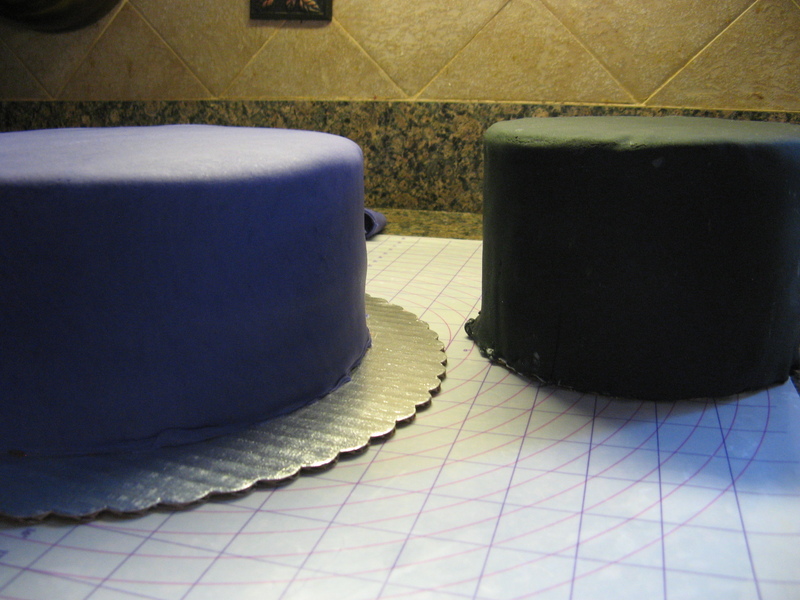 After letting the cakes cool completely I leveled the cakes using a large serrated knife. 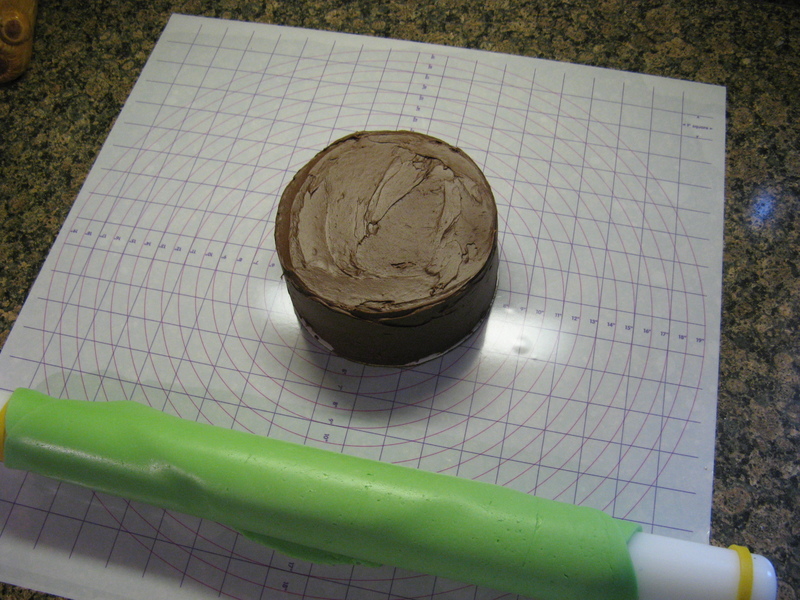 I used to use a cake leveler but have found that using a knife allows me to level the cakes more evenly. Following that I frosted each of the cakes with vanilla frosting and then placed them in the refrigerator so the frosting could harden in preparation for decorating them with fondant. And while I was on a kick making marshmallow fondant recently, I opted to go with store bought fondant to decorate these cakes. 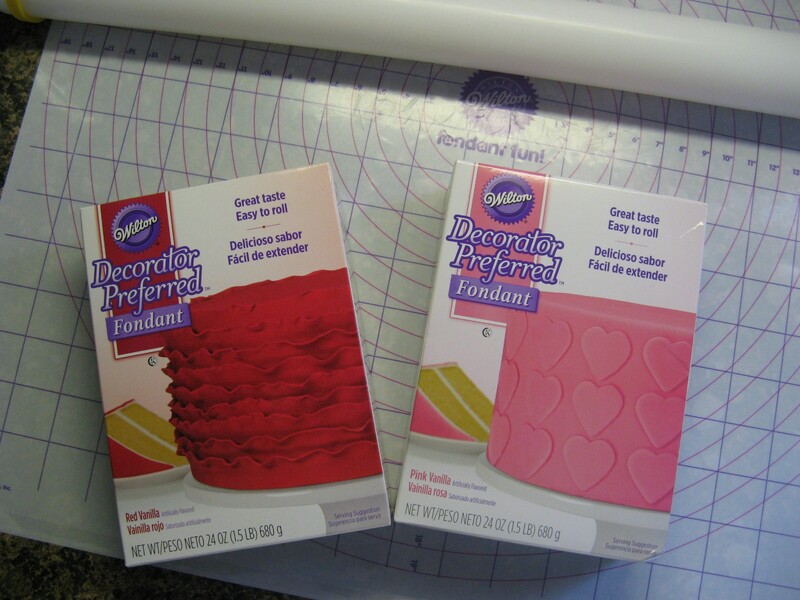 I picked up Wilton’s Decorator Preferred Fondant in red and pink and I was pleasantly surprised; it was easy to knead and roll out. 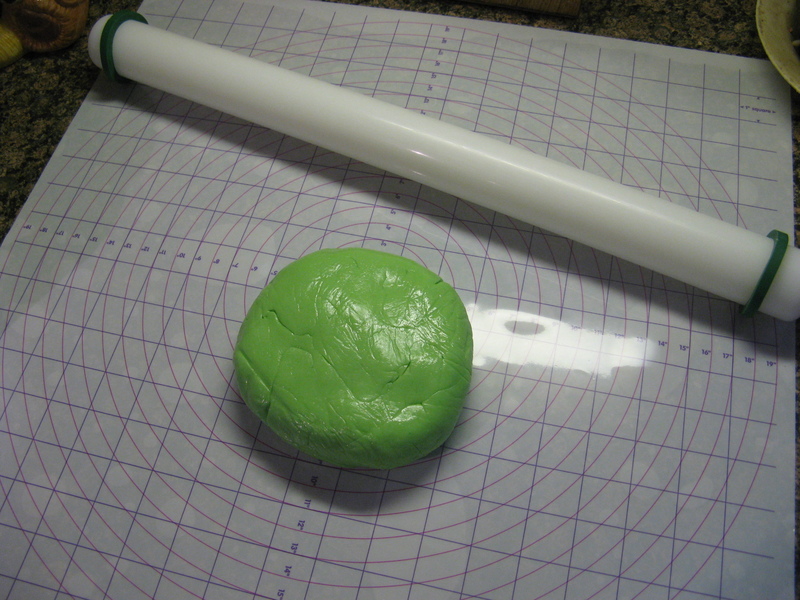 I’ve used Wilton’s Rolled Fondant in the past and it wasn’t as easy to work with. 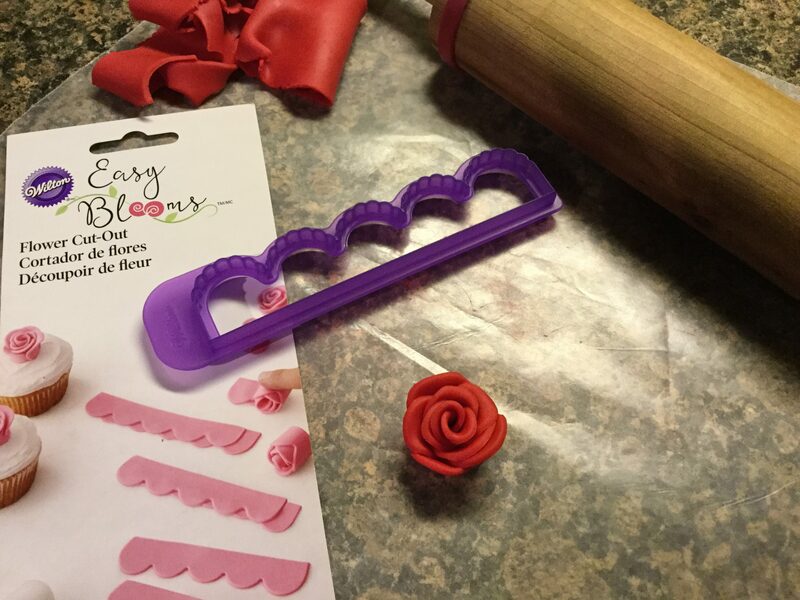 After rolling the red fondant out to an 1/8 of an inch thick I cut two strips of fondant long enough to wrap around each of the heart cakes, one an inch and half wide – the height of the cake – for the top of the candy box and the other two inches wide for the candy box. I rolled up the strips and then unrolled them around each of the cakes. 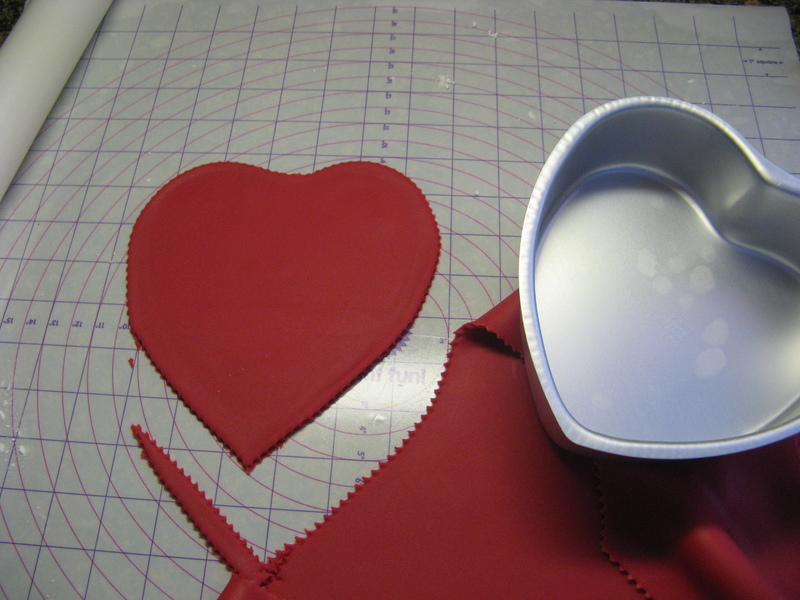 Next I rolled out more of the red fondant and using my heart cake pan as a template, I traced out a heart for the cover of the candy box. 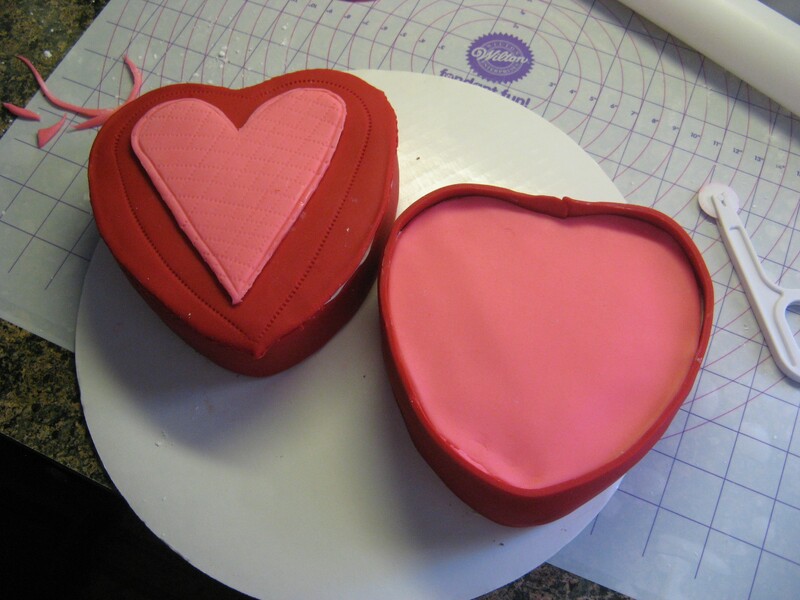 Once I was done with the red fondant I rolled out the pink fondant and cut out two hearts – one smaller than the red cover I previously cut and one to fit inside of the wider red border – the candy box cake. 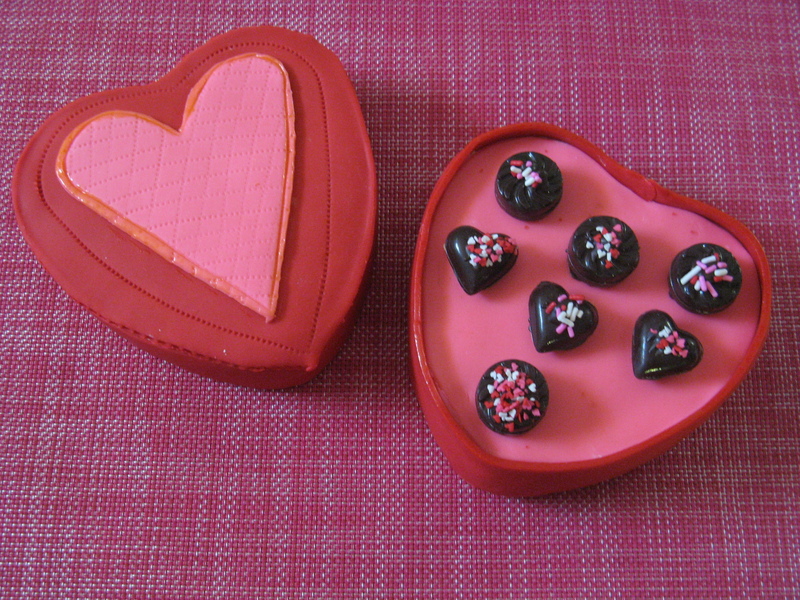 On the smaller of the two pink hearts I used a fondant stitching wheel to etch an angle design. Next it was time to make the candy box cake actually look like a candy box and to do that I needed candy, more specifically chocolate candy. 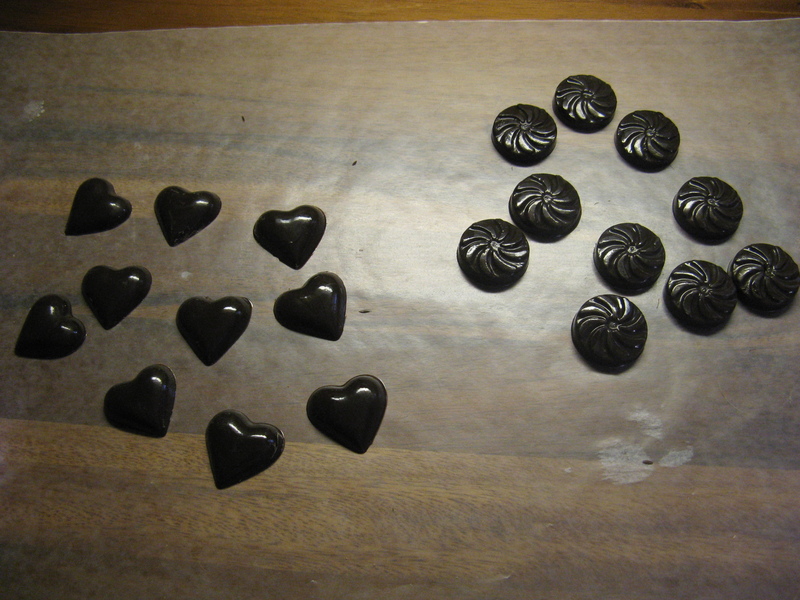 I melted some Wilton Dark Cocoa Candy Melts and filled heart & circle swirls molds to create the candy. 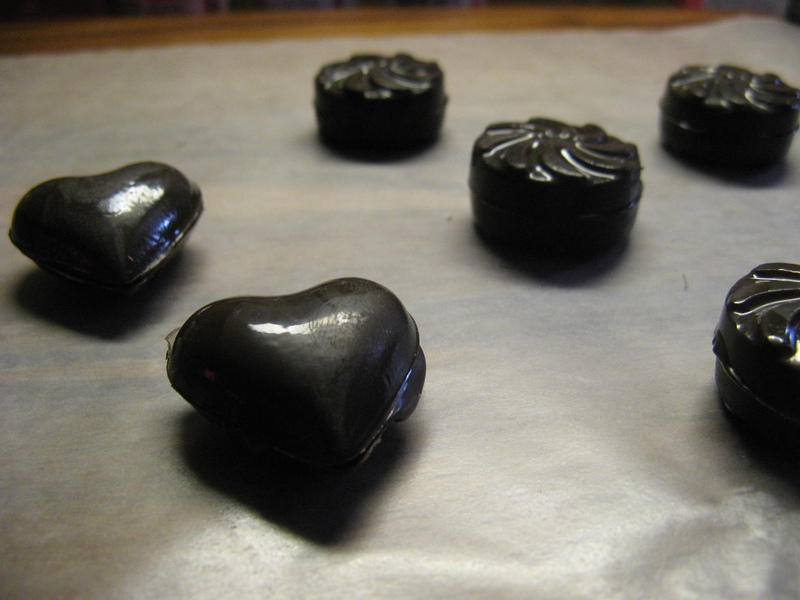 After refrigerating the molds so the chocolate could set I tapped them out onto wax paper. 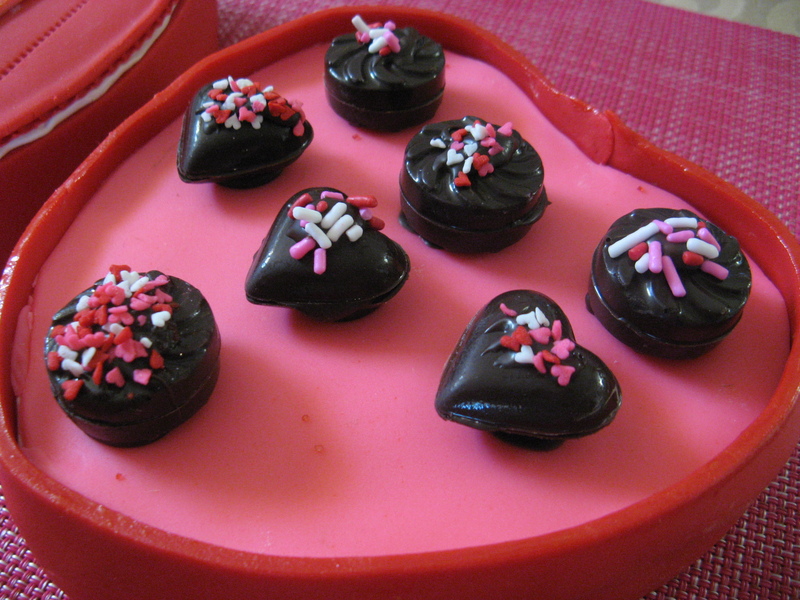 I then used some of the melted chocolate to glue two pieces of the candy together so they would have a little height inside the candy box cake. 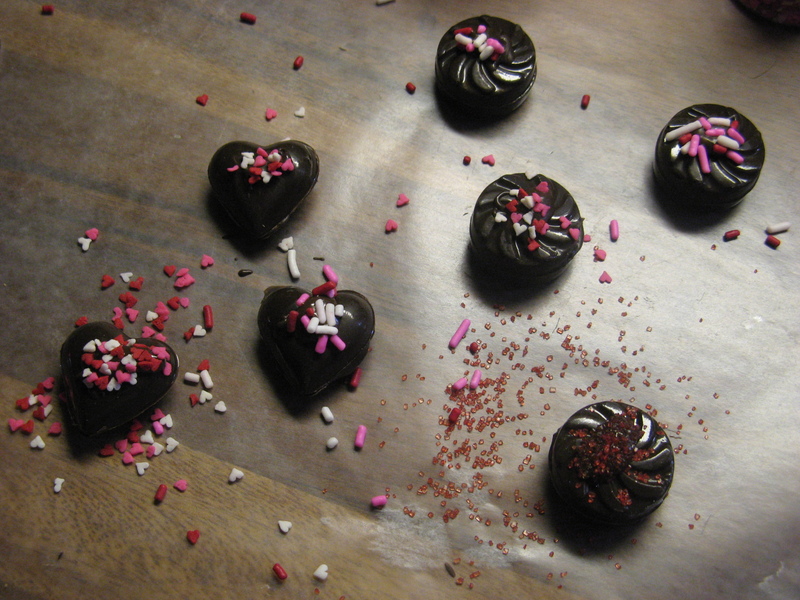 To add a little more pizazz to the chocolates I drizzled them with melted chocolate and then sprinkled them with Valentine’s themed sprinkles. 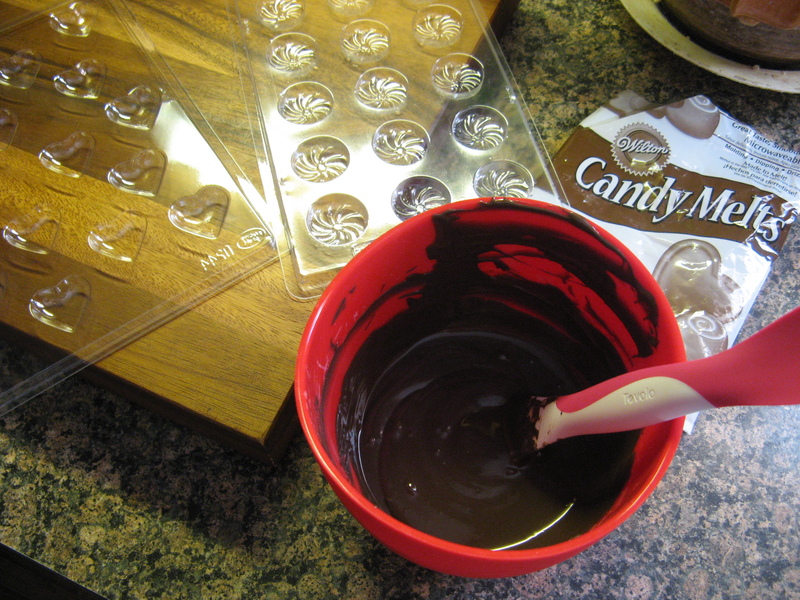 Then I used more of the melted chocolate to glue the pieces onto the candy box cake. 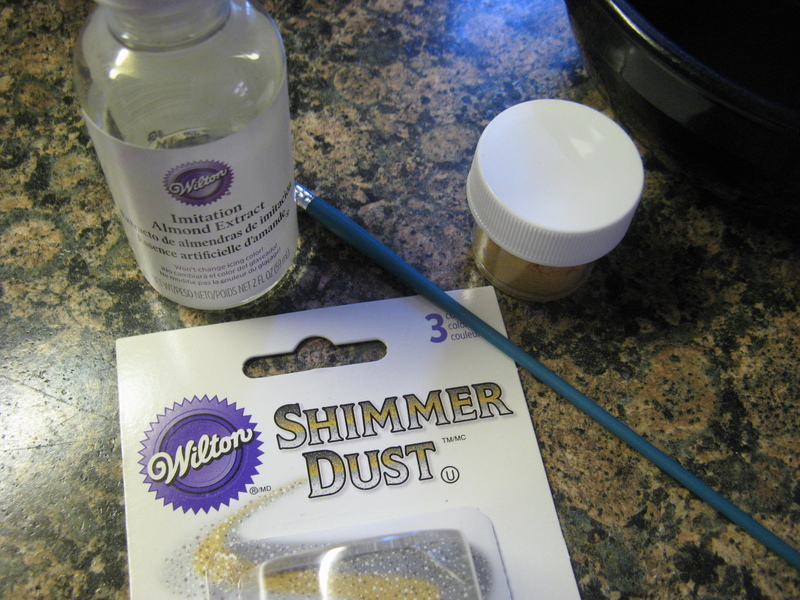 But unfortunately I wasn’t too successful as the powder I have didn’t have the same color intensity. It was worth a try though! While there were some imperfections with my final outcome, overall I was pleased with it. 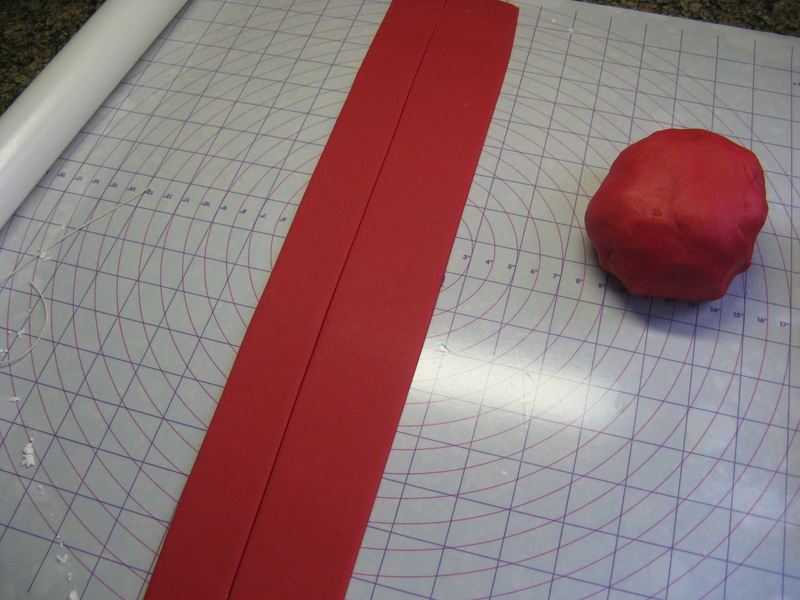 I definitely need to work on cutting fondant shapes and making straight lines when etching a design into the fondant. 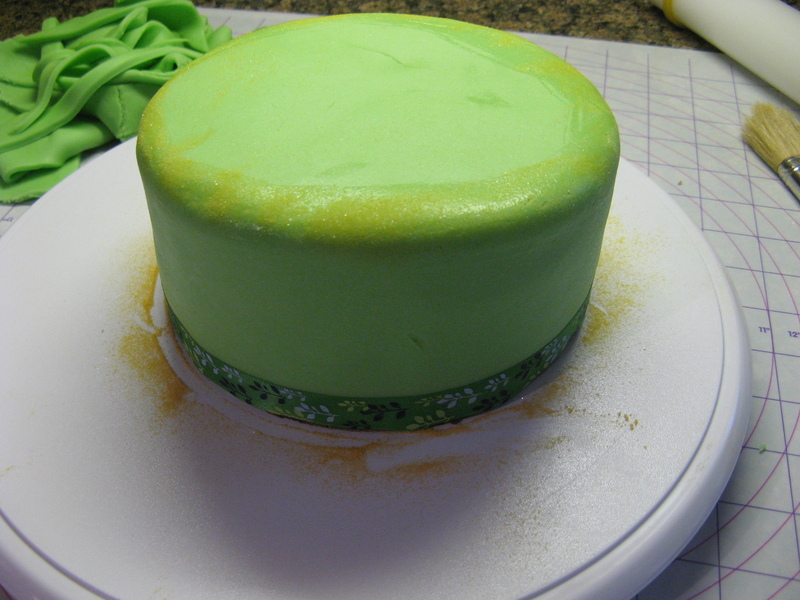 The last time I worked with fondant was a few years ago when I took a Wilton decorating class and while I did like the polish look fondant gave the cake I ultimately didn’t like working with it and more so didn’t like the taste of it. 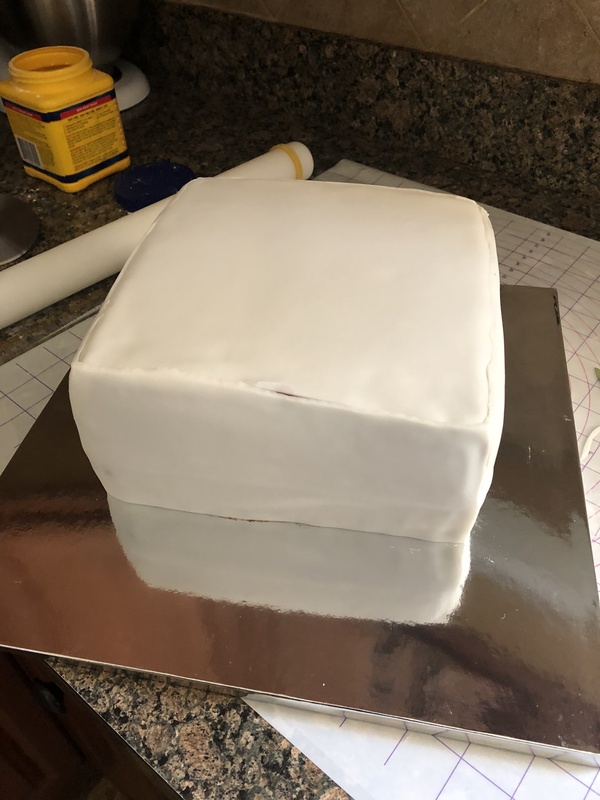 In the very near future (next week) I am planning on making a birthday cake that will look much better covered with fondant as opposed to frosting so I decided to try making Marshmallow Fondant ahead of time to see how the whole process will go. I am very much a planner and like knowing how to tackle a project as opposed to jumping in and trying to fix the bumps along the way. 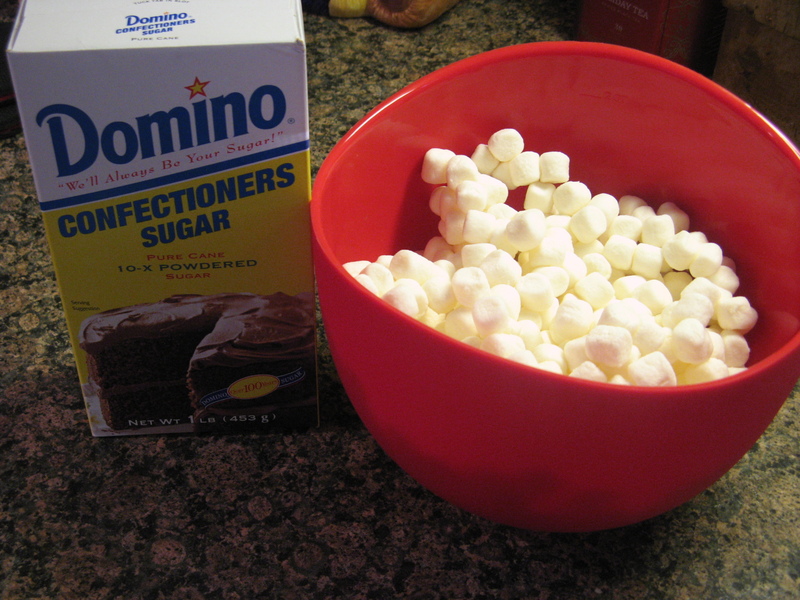 So, all you essentially need to make the fondant is mini marshmallows and confectioners’ sugar. You also need a few tablespoons of water and shortening which you use to grease your hands and countertop when you knead the fondant. First I melted approximately 8 oz. of marshmallows with a tablespoon of water in the microwave at 30 second intervals. Stirring the marshmallows after each 30 second burst. 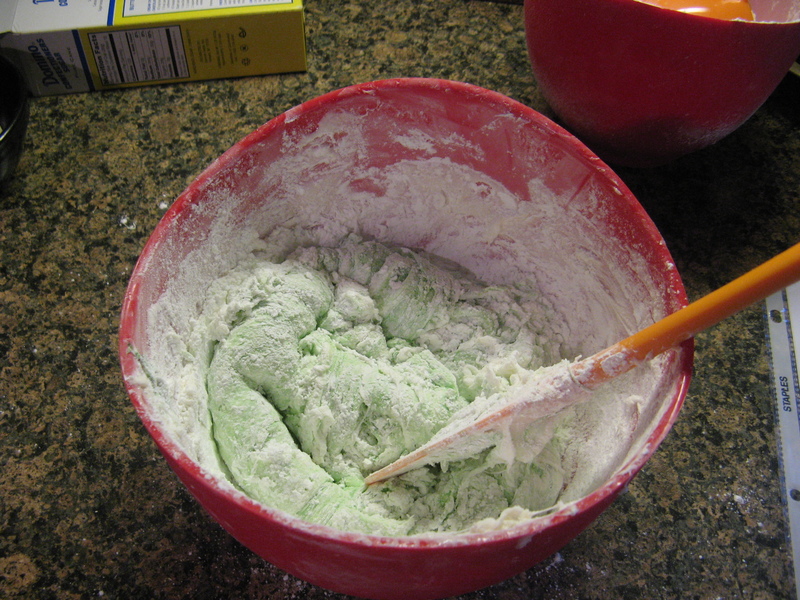 Once the marshmallows were melted I added in some gel based good coloring – I picked green because it was the first one I grabbed that was already open – and about 2 1/2 cups of the confectioners’ sugar, which I had sifted, and folded the three ingredients together. 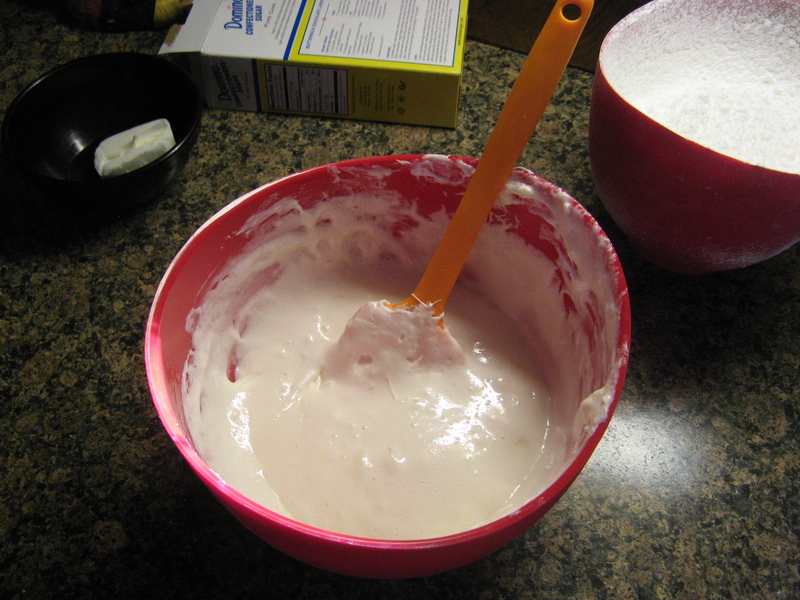 Next I dumped the mixture onto my shortening covered countertop and kneaded it as though I was kneading bread incorporating about another cup of the confectioners’ sugar into the fondant. I knew it was “ready” once it was pliable and didn’t tear when I stretched it. 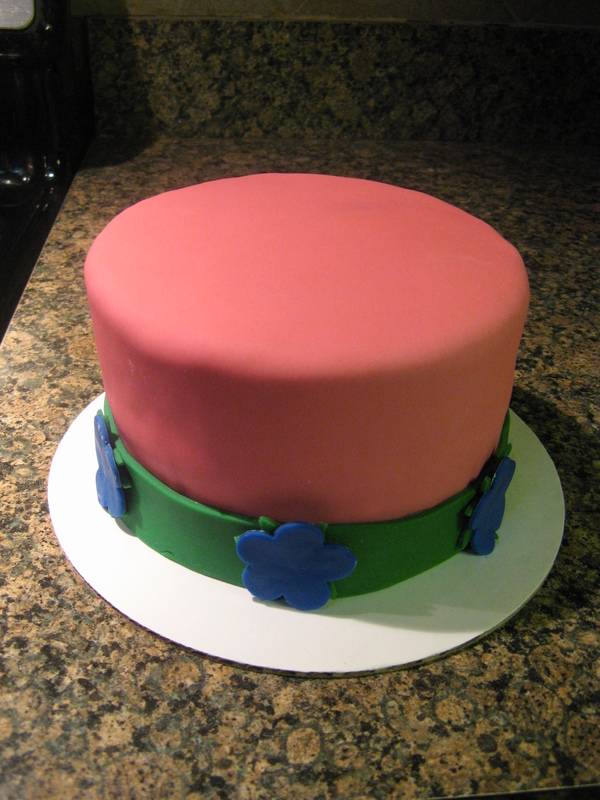 Having worked with store bought fondant before I more or less knew when it was ready. 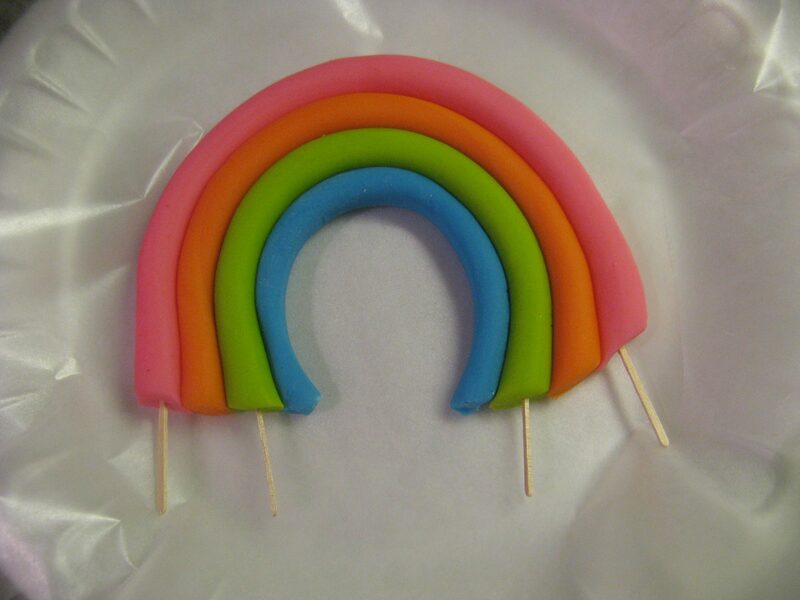 You don’t want the fondant to be too dry and you also don’t want it to be too rubbery. Remember you will be rolling this out and covering a cake with it. 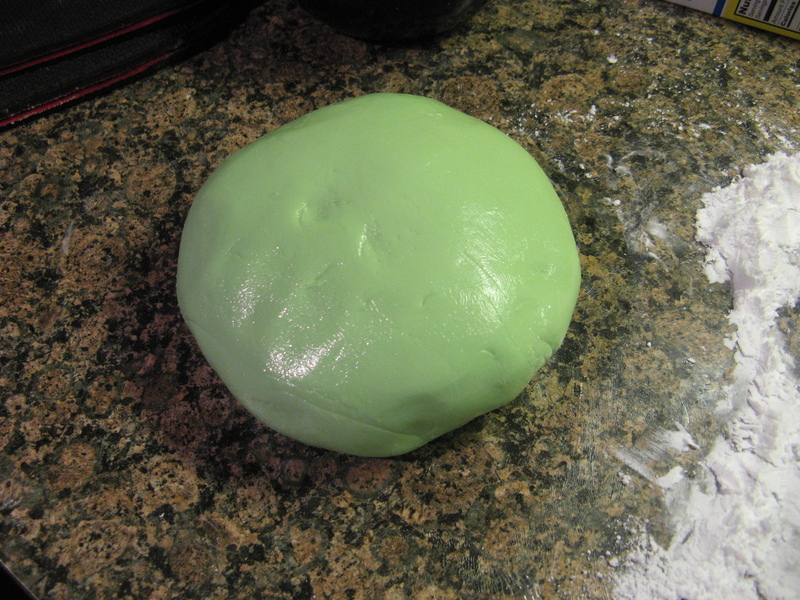 Once I felt that it was ready I formed the fondant into a ball, coated it with a thin layer of shortening, and wrapped it in plastic wrap, put it inside of a Ziploc bag and then placed it in the refrigerator. Now, some recipes I came across didn’t mention putting it in the fridge but I opted to do so. I figured it wouldn’t hurt it at all since it was covered fairly well. I only intended to leave it in the fridge overnight but I ended up leaving it in there for four days, which I am happy I did. Now I know for sure that the fondant can be made quite a few days in advance of me using it. I took the fondant out of the fridge early in the morning so it could come to room temperature by the time I was going to use it. Following that I warmed it in the microwave for two five-second bursts so that it would be easier to work with. Now I was ready to roll it out. 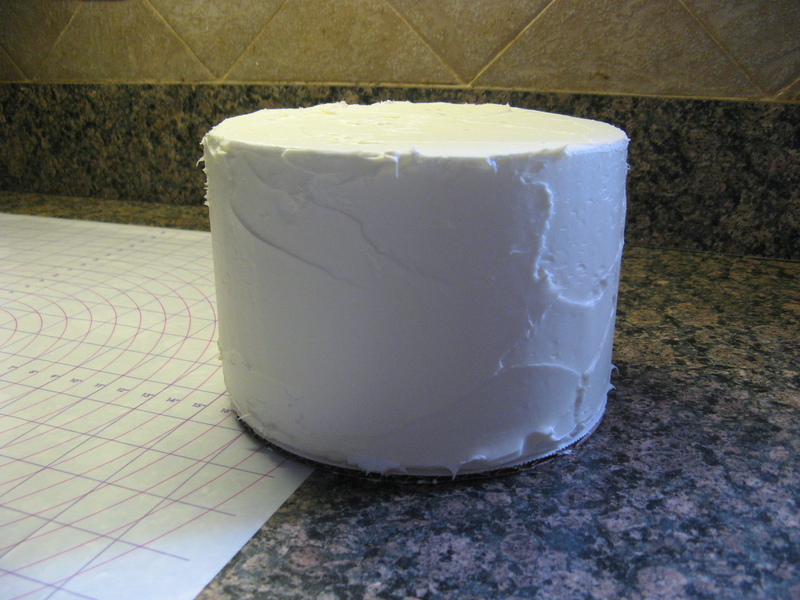 Since I was covering a 6-inch cake that was about 4-inches high I knew I needed to roll out the fondant at least 14 inches. And then rolled it over the cake. And then did a little test decorating. 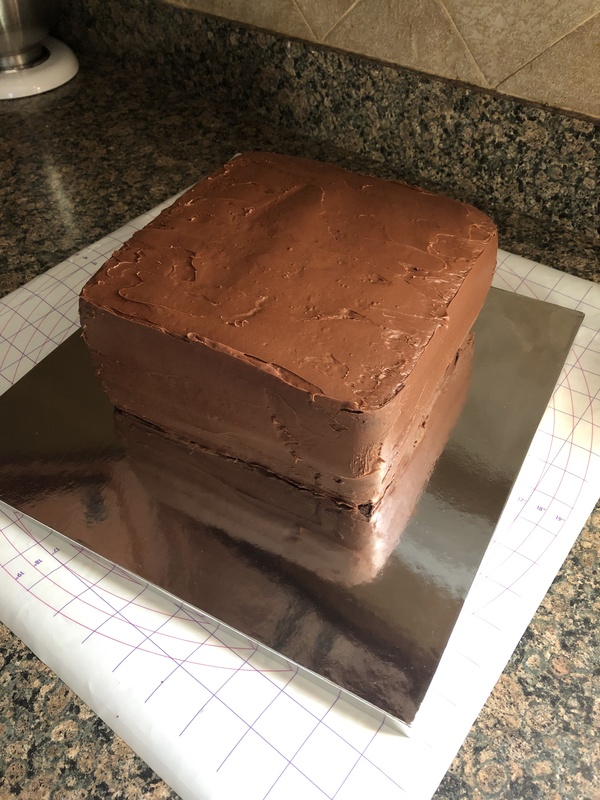 I brushed the edges of the cake with water and dusted it with shimmer powder – the outcome of which I wasn’t all that thrilled with – and then I soaked a ribbon in water, squeezed out the excess water and then wrapped it around the bottom of the cake and used double-sided tape to hold it together. Overall I think I am set and have figured out all the little tricks to make sure when I work on said birthday cake I will be prepared. Oh, and yes this fondant definitely tastes better than store-bought fondant. I probably would be more thrilled with it if I liked marshmallows though! I used to like them but as I got older I just didn’t have the taste buds for them anymore.